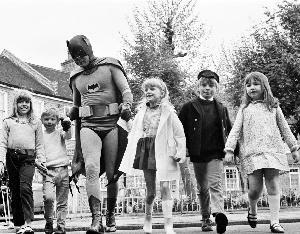 Adam West was a childhood hero to many. He described his portrayal of Batman not as the Dark Knight, but as the Bright Knight, and always sought to make a positive impact on people's lives. We hope you will help us keep his bright light shining on the world, and especially on the lives of children, by donating in his name to St. Jude Children's Research Hospital. St. Jude is leading the way the world understands, treats and defeats childhood cancer and other life-threatening diseases. It costs a lot for St. Jude to cure a child with cancer using the latest technologies and care. But because of donations, the price for patient families is $0. Families never receive a bill from St. Jude for anything. Many families come to St. Jude thinking it's like any other hospital. They expect to pay high fees to get their child the best care. They're overwhelmed with gratitude when they learn St. Jude works to save their child's life for free using world-class care. Frank Barnes - Special Events Staffing, Inc.